Radionuclide hormesis assertions, are fraudulent. They are fraudulent, mainly because exposure to poisons do not in the future, decrease vulnerability to more poison. Quite the contrary, exposure to radionuclide particles and boluses, cause bioccumulation. They cause damage. They makes chronic illness and early death much more likely.. Hormesis is the same nonsense used for cigarrette smoking. One word is common, to the tactics of the professional corporate poisoners, from a long time ago. One word, runs through their vocabulary of legalese and fraudulent science. Hormesis. It is an old con. Perhaps as old as the worlds oldest profession, prostitution. Quite appropo in light of the corporate lawyers and public relation firms, that work for the nuclear industries, pesticide industries, tobacco industries, asbestos industry, and corporate America. Now it is a thousand times as bad, with Chuko-the-clown in power. 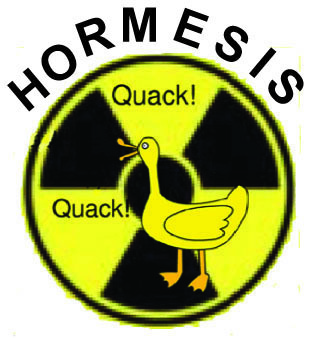 Radionuclide Hormesis is just bogus . Genetic engineers cannot even make CRISPR work, when they try to repair dna in people with genetic illness. That is because of the errors, made by cells and enzymes in living cells. Errors made trying to repair DNA, with CRISPR. The cells themselves are damaged . They cannot do dna repair, with enzyme cleavings and insertions properly because of multiple flaws in enzyme induction and appropriation.. Dna polymerases in these cells cannot repair damaged dna and chromosones. There are many mechanisms, of damage from radionuclides to the body. Radionucides do, to the body and tissue, more than acting as mutagens, causing dna cleavages and chromosone breaks. Their global damage is ravaging across all systems and cell types in the human body. Radionuclides are cytotoxic. They can act as heavy metal poisons, to breakdown the machinery of enzymes and metabolism in cells. They fry nerve cells and heart tissue, important for transmission of electrical signals in the heart and nerves. They destroy important endogenous process like insulin secretion in the pancreas and thyroid secretion. Dr Busby talked about a study at Los Alamos, where dogs were exposed to small amounts of plutonium, in their lungs. They all got lung cancer, in a couple of weeks. They all died. The dogs at Los Alamos died of lung cancer because, a microscopic dose above, threshold- acute caused damage. Just a small amount, of the plutonium caused irreversible damage to the dogs lungs leading to cancer, very quickly! Does that sound like hormesis to you? 30 billionths of a gram of iodine 131 in a cocktail , will destroy a thyroid gland. Look it up in a pharmacology book. That is what pharmaceutical iodine 131 is used for . Corporate lawyers, that have pushed the fraudulent scientists, that have pushed the fraudulent and murderous lies of nuclear hormesis, tobacco-smoking hormesis, coal hormesis, pesticide hormesis, mercury hormesis. They say poison did not kill your brother. They say poison will make you stronger and better. They will say it to your face, as you lay on your death-bed! Dr. Busby is concerned with radiation modeling, because of his work with the European Commision. Dr Busby understands that radionuclide toxicology and bioccumulation, are far more important than external radiation exposure. External radiation diminishes to the square of distance. Ingested radionuclides are inside you, irradiating and poisoning you. Prof Busby talks about how they did not even have instruments, during the test era to measure what radionuclides were in fallout. They do now. We know how teratogenic, mutagenic, carcinogenic, cytotoxic, radionuclides are. We know they cause heritable defects. Environmental toxicologists and professionals like Marco Kaltofen and physicians like Dr. Conrad Miller know the doses of cesium 137 in the environment, that lead to specific heart damage. MILLER AND Bandechevsky studied cesium137 in chernobyl victims, in Ukraine and Belarus. Plutonium is quite toxic to the liver, and brain. It is because of the way, it mimics iron. Strontium has strong affinity and toxicity, to the bone tissue. Californium ruins the bodies ability to make redblood cells. RADIOACTIVE iodine RUINS the thyroid. There are many more radionuclides with examples of specialized toxic effects. They all cause cancer because of their mutagenic nature to dna and chromosomes! Rod adams the pronuker loves hormesis. He wants to use plutonium to run an automobile. Possibly one of the stupidest and craziest men on the planet!